Place the apples, water and caster sugar in a small saucepan over a low heat and cook until softened, then purée to a coarse texture or mash with a fork. Leave to one side to cool. In a large bowl mix together the apple purée and whipped cream. Leave in the fridge until ready to serve. Melt the butter in a frying pan. When hot, add the apples and cook for a few minutes until golden and tender. Add the sugar and cook until the mixture caramelises. To assemble the complete dish, place a brandy snap basket in the centre of a large plate. Put two dessertspoonfuls of apple mousse into the basket. 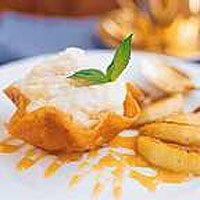 Add some of the caramel apples around the outside of the basket, dust with icing sugar, garnish with fresh mint and serve. Take a slice of brioche or panettone, dip it in a mixture of beaten eggs and cream, pan fry in a little butter for 2-3 minutes. Dust with caster sugar and serve with any flavour of fruit jam, gently warmed, and a large spoon of Cognac Cream. When making crème brûlée use any one of the flavoured creams instead of plain cream to make it extra special. Place dried figs in a frying pan with some Cognac Butter and gently cook for 2-3 minutes. Add a couple of tablespoons of orange juice and reduce slightly by simmering in the pan. Serve with crushed amaretti biscuits and some fresh whipped cream. Peel 2-3 large oranges, remove all the pith and cut into slices. Pan fry with some Cointreau Butter for 2 minutes. Place oranges into some ready-made crêpes warmed through, roll up, dust with icing sugar and serve with Waitrose Organic Vanilla Ice Cream. Instead of using brandy snap baskets you could use Langue de Chat biscuits. Pears could be used in place of apples.